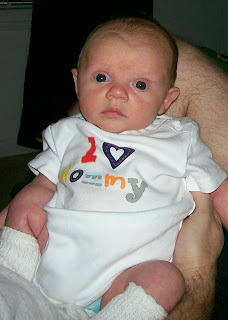 Brady in one of his cutest shirts! And look at that face - what a sweet boy! 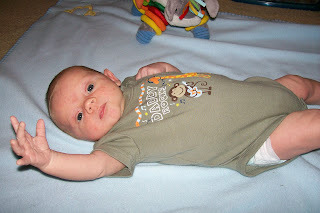 Brady is 1 month old today! 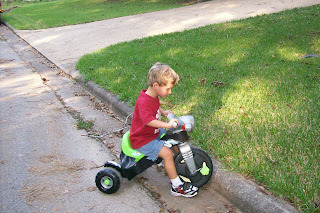 Recently, Dawson has enjoyed "racing" his tricycles and scooter down our street. 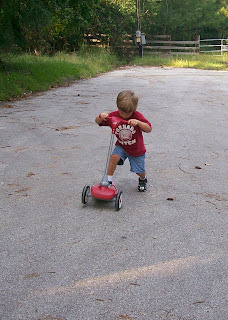 It's great exercise, as he'll go all the way down the street, turn around, and pedal back - over and over again. Sometimes he wants me to race him on the scooter and other times he wants me to be the audience and cheer him on. He's so cute and fun! 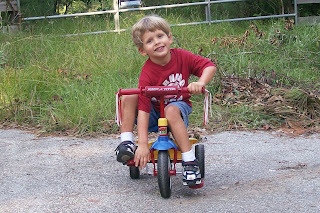 Getting ready to race on the tricycle. "Crashing" his motorcycle into the curb. He was so amused by this. 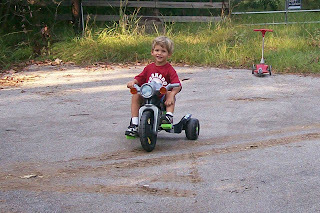 Sometimes he would be going so fast when he crashed into the curb that he would flip over into the grass, which he really thought was great fun. Zipping down the road on his scooter. 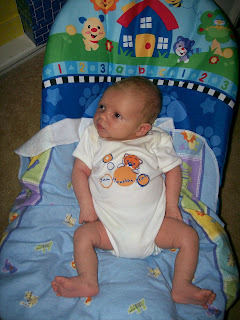 Brady hanging out and looking around. He's spending more time alert these days and enjoys looking at everything in his environment. 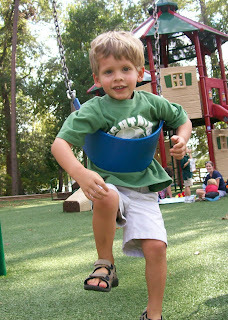 This week, we've spent a couple of afternoons at the neighborhood park. The beautiful fall weather has brought many friends to the park and Dawson has thoroughly enjoyed playing with all of his friends. 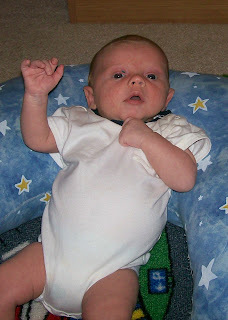 Pretending to be a superhero by "flying" on his stomach on the swing. 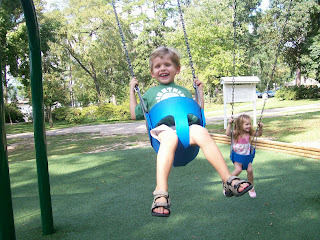 Dawson and Kaelin being silly swinging in the baby swings. 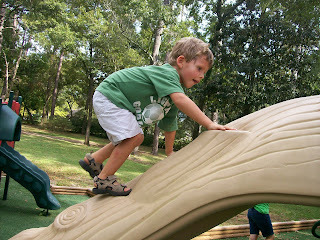 Concentrating on climbing the log. 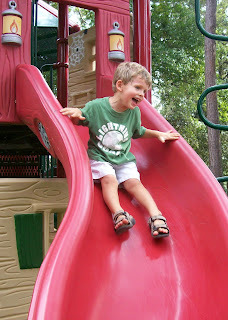 Laughing as he slides down the slide. 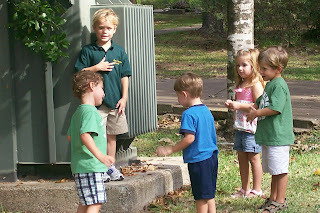 All the young kids listening to Pierce (the big 5 year old) explain the rules of freeze-tag to them. 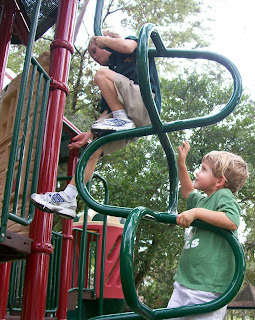 Following Pierce up the ladder. He seemed to really enjoy playing with a big kid. 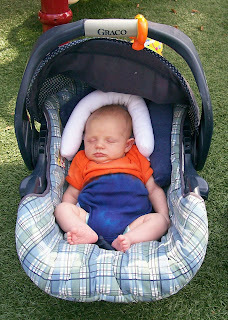 Brady spent most of our time at the park asleep in his car seat. 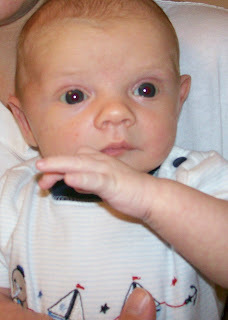 A close-up shot of our precious little boy. 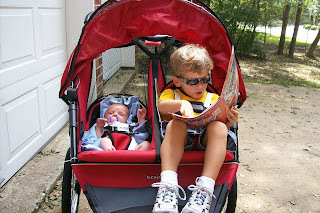 Dawson and Brady on their first ride together in the double jogging stroller. My doctor has strictly instructed me not to run in the 6 weeks following Brady's birth, but it was nice to take the boys out for a walk. 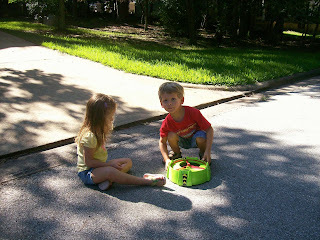 We enjoyed the beautiful weather as we strolled through the neighborhood to the park where Dawson played with some friends and Brady enjoyed looking around. Brady enjoying some time with his neat bear toy. Whenever he kicks the hanging ball the bears head moves, his nose lights up, and he laughs. 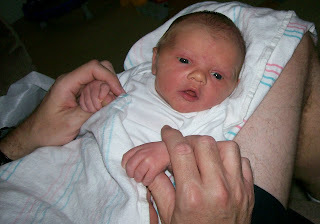 Brady is 3 weeks old today. He's spending more and more time awake, although he still spends the majority of the day asleep. 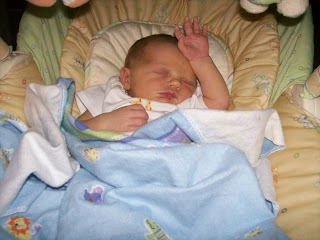 Even though he sleeps a lot, it's not for very long periods. The nights are pretty brutal, as he'll frequently wake up every hour and half (sometimes less!!) and the longest he's slept is 3 hours. We're lucky if we get one 3 hour stretch in a single night. We are hoping and praying that he'll start sleeping better soon. 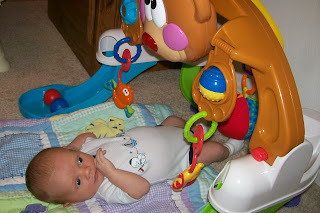 Brady is beginning to show interest in various toys. He'll stare at them for long periods of time and enjoys seeing them move when he accidentally hits or kicks them. 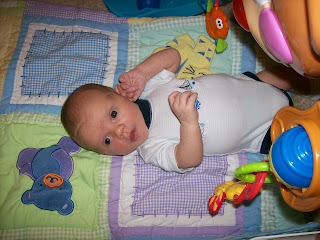 His neck muscles are also getting stronger and he's able to hold his head upright pretty well. His little collar bone is also healing well (it snapped when he was being pushed out, which is apparently not that uncommon with big babies) and should continue to heal on it's own. Brady seems to have a very sweet disposition. He goes with the flow of things pretty well and he absolutely loves to be held. He especially likes to sleep in our arms. We've also seen him smile when he's dreaming and he has an adorable smile. Of course, we think everything about him is adorable. 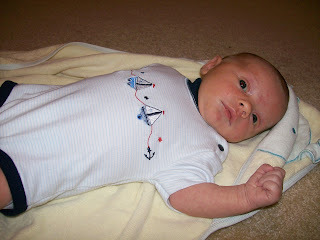 Below are a few recent pictures of our little cutie. Hanging out in his chair. 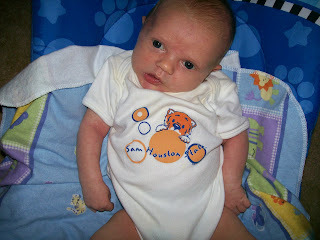 Looking cute in his Sam Houston shirt. 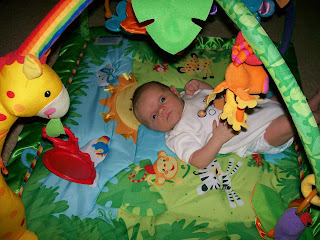 Enjoying some time on his playmat, looking at the many colorful toys. Focusing on the toys hanging above him. 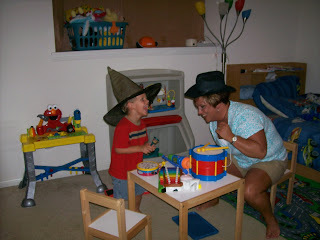 It's been a long time since we've posted anything on our blog, but we have a really good excuse - we endured a hurricane! I've never been overly concerned about hurricanes as we live more than 100 miles from the coast, but Hurricane Ike blew right through Huntsville and our poor town really suffered. People were injured or killed, there was extensive property damage, big beautiful trees were completely uprooted, and the entire town lost electricity for several days. Some businesses, like the university, were powered by generators, but most businesses and residences were without power for many days. The power went out at our house around 6:00 am Saturday morning and didn't come back on until 8:00 pm Wednesday night. Thankfully, we're all safe and our house wasn't cratered by a big tree. Our yard was littered with limbs, many of them very large limbs, but miraculously none fell on our house. 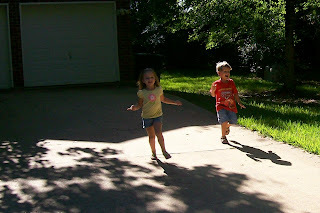 We were all at home through the hurricane and the day after, but after learning that electricity wouldn't be restored for many days, possibly weeks, the kids and I headed up to Frisco to stay with my grandmother (thanks for taking us in, Nanny!!!!). Randy remained in Huntsville to work at at the shelter at the university where many evacuees were staying. He said it was a very sad situation for many of the people there who had lost everything in the hurricane. 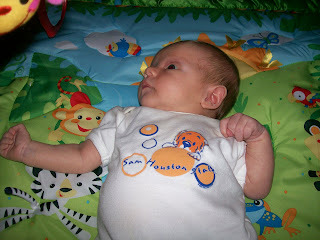 Considering the devastation that Hurricane Ike caused, we were extremely blessed to have only lost power for a few days. We just wanted to let everyone know that we are fine and we'll be posting new pictures soon! 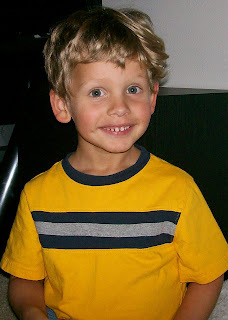 Dawson was so happy to have company this week. 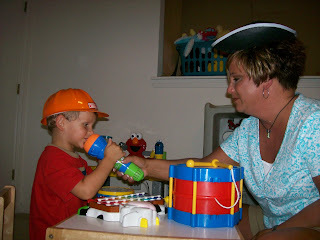 Nanny and Julie both came to visit and he had a great time playing with them. 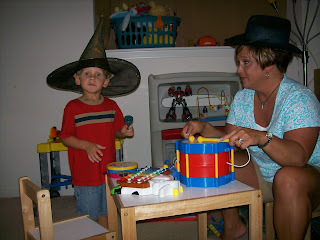 He had an especially good time playing musical instruments with Julie. 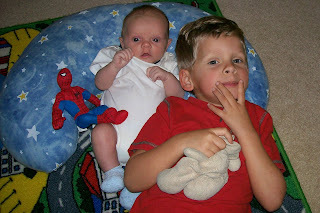 The brothers enjoying lying and looking at one another. 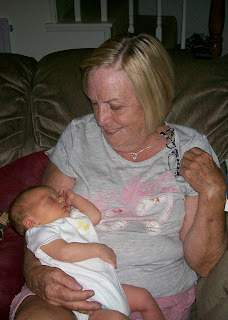 Brady sleeping in Nanny's arms. 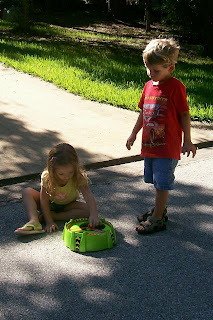 Dawson and Kaelin trying out a new toy. They push a button and it sends rings flying into the air. Dawson smiling proudly after reading his story to us. It's a page from his reading lesson book, which seems to be working very well. It's amazing to hear Dawson read the little stories throughout the book. 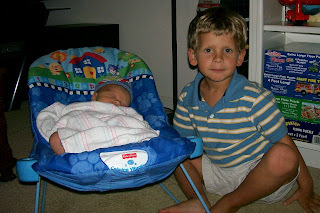 Dawson has had some interesting comments and interactions with his baby brother. 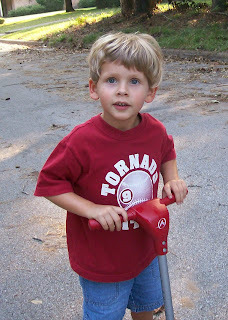 He's asked me several times, "Mom, is Brady going to stay out or will he go back inside you?" 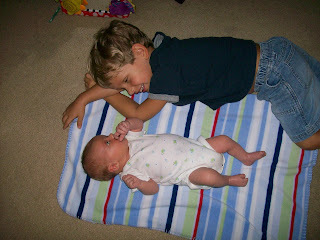 At the hospital when Brady was crying very loudly and keeping Dawson awake, he said, "Shhhhhh, Brady, be quiet." 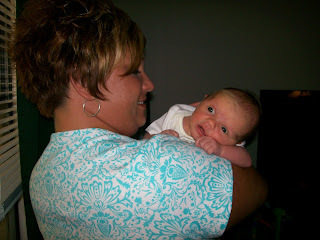 When Brady continued to cry, he was astounded and asked Randy, "Dad, why is Brady not being quiet?" He's also very eager to share with Brady. He shows him how his toys work and even offers to share his snacks with him. This morning Dawson was looking at Brady and talking to him and had his face very close to Brady's when Brady suddenly latched onto Dawson's nose and started sucking it. Dawson thought it was hilarious and wanted Brady to do it again and again. 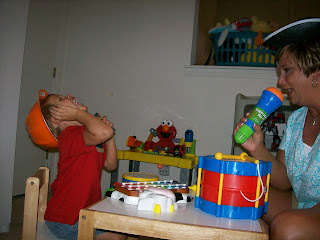 It was great fun for Dawson, but frustrating for Brady, who was really hoping to get some milk. 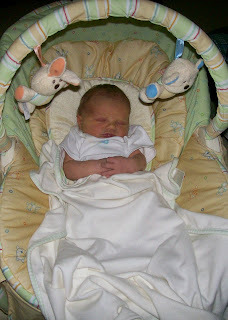 Brady snoozing in his glider. Enjoying some time in Daddy's lap. 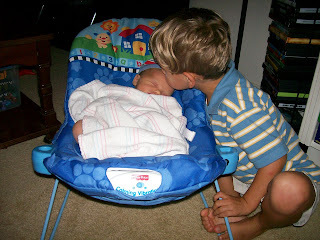 Dawson checking on baby Brady. Giving Brady a big kiss. 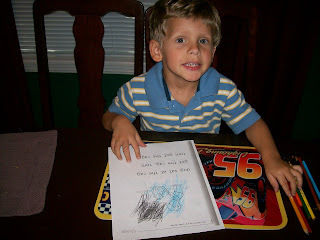 When Dawson was drawing the other day he made pictures for everyone in the family, including Brady. 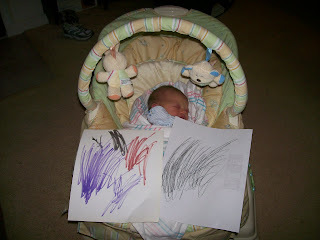 When he was finished he gently put the pictures in Brady's glider, being very careful not to wake him up.